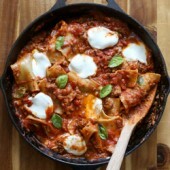 An easy and flavorful skillet lasagna, ready in just 30 minutes! A perfect dinner for any night of the week. Heat olive oil in a 12-inch skillet over medium/high heat. Saute onion and bell pepper until soft and onions are nearly translucent. Add garlic, cooking for 30 seconds. Add ground beef and seasonings, cooking until meat is no longer pink. Drain fat as necessary with a large spoon. Reduce heat to medium/low. Layer broken noodles over beef and vegetables. Pour tomatoes and pasta sauce over noodles. Cover and bring to a simmer, cooking for roughly 20 minutes or until pasta is cooked to your liking. Stir in ricotta and top off with fresh mozzarella. Cover to melt cheese. Sprinkle with freshly grated parmesan and basil prior to serving.